Dark Fantasy. Dragons. Intrigue. Romance. Because I’m not only fighting for my life . . . but also a love that could be the very key to my freedom. I received a free copy from the authors and voluntarily reviewed it. I have really enjoyed all of Kelly St Clare’s books that I read so far, so I was excited to start this one. I hadn’t read any of Raye Wagner’s books yet before this one, so I wasn’t really sure what to expect from her writing. I have to admit that when I first saw the cover I thought it would be an adult paranormal romance book with dual point of view, quickly I figured out it would be more YA dark fantasy. But even so I felt like I went into this book with just a tad the wrong expectations. Blood Oath is told from first person point of view of main character Ryn. It tells the tale of a kingdom ruled by an oppressive king, the peasants are starving and rebellion is brewing. It wasn’t what I had expected at all. There is very little romance, just a hint of it and I didn’t fully feel it. And it’s mostly a dark fantasy story. With lots of bad things happening. There are dragons. And healers. My main issue with Blood Oath was that it was just too dark and bleak for my tastes. I always find dark such a hard term to define and in some books I am fine with a bit dark, depending on what kind of dark it is. In this book it was just a bit too much for my taste. There are lot of bad things, people being killed, people being tortured, a king who is very evil and a bleak situation for the main character with no hope in sight. I skimmed over a torture scene, but luckily most torture scenes weren’t written full out. I felt like so many bad things happened to the main character I just stopped caring at some point. Her whole life and outlook was so bleak I found it hard to care and I had wished for a bit more light and uplifting scenes now and then, but there was little of that. I also thought the king was a bit too evil, but I think that’s the point. If he ever had good intentions, they all disappeared now and only a ruthless, mean and oppressive ruler remained. What I did like was that it was well written, I really enjoyed the first 20% or so of the book, the world building was unique and I liked how they gave the dragon shifters some unique touches and powers. And I do feel like this is a good book, it was mainly just too dark and bleak for me and I had trouble caring about the characters. I also had hoped to see more of different locations. Most of the story takes place in one place and I just wanted to visualize something else than that bleak dark place. But if you like a story about a girl who gets beaten and has so much bad things happening, but keeps on fighting then you might enjoy this book. Ryn seemed like nice main character, although I never fully cared about her. When we first meet her she seemed like your everyday girl who works hard. She isn’t interested in getting into trouble or joining the rebellion, but she would like a bit of adventure in her life. She gets more than she bargained for when she gets captured. I did wish we had read more of her thoughts. there are some strange or off things happening and I felt like she never really thought these through. Like a very important scene at the start that was so obvious important and she never really seemed to give it much thought about what her other’s words meant. I predicted most of the plot twists, but Ryn was totally surprised by then each and every time. It just felt a bit off as there were some big hints and if she had thought about things a bit she could’ve at least have some more doubts. Ryn seemed very tough and resilient, which she needed in her situation and served her well. She wouldn’t let them break her, but she did come very close and did broke down at times. I had just wanted she had a bit more smarts, as she had more than enough time to think things through. She also turned into a bit of a special snowflake, but I am kinda curious about that too. And I still feel annoyed at when she went back early on in the book, it just felt unrealistic and annoying as it was so clearly dangerous and she was no fighter. What I thought was very well done was how the authors made me change my opinion about Lord Irrik over the course of the book. I think he’s the love interest, but at first I totally didn’t like him at all and just couldn’t see how this could turn into a romance. But as the book progresses we learn more about his character and understand why he does the things he does and I actually changed my opinion. I still feel like he isn’t a very likeable character, but at the end I did understand why he did what he did and it did make sense. I just felt that even with the situation being what it was there was no reason he couldn’t be a bit more nicer sometimes or tell Ryn some things. Yes he was afraid of something, but at the same time she proved that wasn’t really anything he should be afraid of. But he did care in his own way and did help her. We get a bit of world building in this book, but it’s pretty limited. In the first 20% we get a bit of a feel for the world. How the peasants live, how the king rules and the Drae his role in this. We know there are some other countries, but we don’t hear much about those until at the very end. Then over the course of the book we get to know a bit more about the dragon powers and pheatyn powers, but it stays pretty limited. We really only know what Ryn knows and she knows very little about this and others don’t tell her much, so the reader’s understand stays limited as well. Sometimes I just wanted to know a bit more, but it did make sense we don’t know more. I did roll my eyes how some of the dragon and pheatyn powers involved kissing, that just seemed weird/ a bit too convenient. The pheatyn powers and how they worked seemed pretty cool and silly at the same time. But it sure was unique. 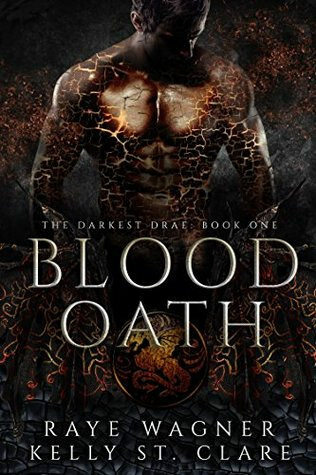 To summarize: Blood Oath is a dark fantasy novel featuring dragons, healers and a fantasy world with an oppressive king. I really enjoyed the start of the book and it sucked me in, but once the book progressed I started enjoying it less and less. Mostly it was just too dark and bleak for me, it just felt like too much. So many bad things happen and almost no happy or uplifting things and it made it hard for me to care about the characters. Ryn did seem like a decent main character, she was tough and resilient, which served her well. but I also felt like she could’ve thought things through a bit more. There were some plot twists I predicted with ease and for the main character it all came as a big shock. I thought it was very well done how the authors wrote the book in such a way I changed my opinion of Lord Irrik as the book progressed. At first I didn’t like him at all, but as the book progressed I grew to understand him better and got why he acted that way, although I had wished he was a bit nicer at times and had told Ryn some things. There is a hint of romance, but I didn’t fully feel it yet and with how things end I am not sure how it will get there. We get to know a bit about the world and the dragon and healer powers, but it’s pretty limited as Ryn the main character doesn’t know much. I did wish we got to know a bit more about the world. I liked how there was some unique touches to some of the dragon powers. Overall I do think this is a good book, but for me it was too bleak and dark and I had trouble fully enjoying it because of that. Do you like dark books? I do like dark books when I’m in the right mood. I do tend to do better if I’m expecting that tone in the book. I can get disappointed though if I feel like the ‘dark and evil’ seems overly much even for an evil person or that the heroine seems oblivious about the obvious stuff when its not that hard to see coming. Good that the love interest has a complex character that slowly won you over. Appreciate your thoughts on this one. I might pick this one up some time. I usually am not a big fan of dark books, but it does really depend on the book and my mood and what type of darkness the book has. The dark and evil from the evil guys just seemed a bit much and I would’ve liked if the heroine picked up a few more hints. The love interest was really well done and I liked how we got to understand him better piece by piece. I am always impressed when an author can change my initial opinion of a character like that. Not really. I don’t mind if there’s a little darkness, but there has to be a good balance. Otherwise it’s just depressing to me. I usually prefer when a book that is dark, also has some lighter scenes to balance things out. I don’t mind dark books as long as I like the story and this one sounds like a book that I might like. The story was well done and it did had some good parts, but it was just a bit too dark for me. If you like dark books, you might like this one. Hmmm, idk. It sounds like the darkness in this one might be over-the-top as well and like there are a lot of things that would frustrate me. Don’t you just love when paranormal powers and whatnot just so happen to conveniently involve kissing or sexual stuff? *rolls eyes* Lol. But I like the sound of some of the stuff in this book. I got the same vibe as you about the adult PNR, but the fact that it’s not super focused on the romance actually makes it appeal to me more. I will save this on my list and maybe look into some more! It felt like the darkness was a bit over the top here indeed. It did make sort of sense, but it still felt like a bit too much. Then again I don’t like too much darkness in books, so that could be also the reason it felt that way to me. And I just had to roll my eyes at the paranormal powers that involved kissing, it just doens’t make sense. And one of the powers probably could work another way, but she just went for the kissing thing. But there were some things that were done really well, how they wrote Lord Irrik was so well done, I really disliked him at first and then gradually I started to understand his actions better. The cover does scream Adult pnr to me, but it’s actually YA and the romance is only a side plot. I thought it was important to clarify that. I can sort of understand that, too much of almost anything in a book gets boring after a while. A book needs a bit of balance. It was very well written, but just a bit too dark for me. I also want some lightness to balance out the darkness. okay I want to grab this one and now. I love me some dragons!! If you like dragons you might like this one :). I also like dragons, but sadly this one was a bit too dark for me. I was so glad to read your review of this book. I am almost done reading it, and like you I like it less and less as I go along. Other reviewers were giving this book such high praise – I wondered if I was missing something. Ryn is either incredibly naive or incredibly stupid – I haven’t decided yet. I will finish the book, but I will not continue the series. Yes, it is dark, which normally would not bother me, but it is ALL dark with very little if any relief for ANY of the characters. On a positive note, it is well written and flows easily. I am glad to hear you found my review. It sure had some good points and indeed the writing was well done and flows well. I am not a big fan of dark and if a book is dark I want some relief for the characters like you mentioned. I didn’t continue this series, but I would recommend Kelly St Clare’s other series as I did really enjoy those.